Today, ICAN UK sent a letter on behalf of 34 NGOs to the Secretary of State for Foreign and Commonwealth Affairs, emphasising our disappointment with the UK government’s current position on the ban treaty negotiations starting at the UN in New York next week. Nuclear weapons must be prohibited and eliminated due to their catastrophic humanitarian consequences – and refusing to participate in these negotiations is completely out of step with the aim of achieving a world without nuclear weapons. This month, the majority of the world’s states will meet at the UN in New York to start negotiations on a treaty to prohibit nuclear weapons. These talks give an historic opportunity for an important step towards the total elimination of these weapons of mass destruction. This conference is open to all states, and we are deeply disappointed that the UK government has refused to participate. The evidence clearly shows that nuclear weapons have catastrophic and unacceptable humanitarian consequences. Aid agencies and the International Committee of the Red Cross have emphasised that no meaningful humanitarian response can be mounted to address the impact of a nuclear detonation. The risks of accidental or deliberate detonations are also severe – including to UK citizens wherever these weapons are hosted or transported in this country. The majority of countries have therefore recognised the moral and security imperative to prohibit nuclear weapons by an international treaty – an urgency that the UK should also acknowledge. The UK government has emphasised that it possesses “only 1%” of the world’s nuclear arsenal, but the destructive power of the UK’s nuclear arsenal still exceeds that expended during the six years of World War II, and has the capacity to cause immense civilian casualties, global famine and long lasting climate disruption. No matter how many nuclear weapons Britain has, these technologies remain unacceptable and dangerous. 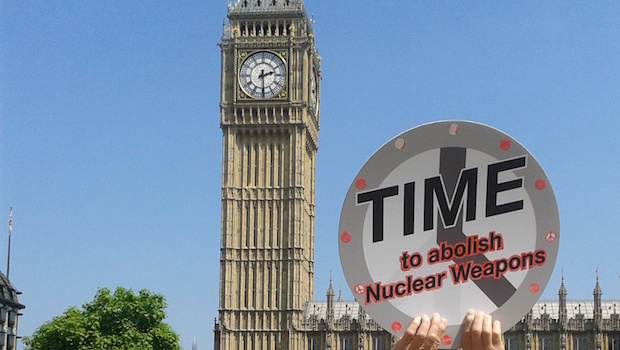 We welcome the UK government’s frequently stated commitment to working multilaterally for nuclear disarmament, including on international legal measures such as the Comprehensive Test Ban Treaty and the proposed Fissile Material Treaty. We believe that refusing to participate in talks on a nuclear weapons prohibition treaty is completely out of step with the aim of achieving a world without nuclear weapons. This boycott also contradicts the UK’s commitment to the protection of civilians in armed conflict, and to being a leader on the world stage and in the development of international law. The government has stated that it will not participate because it “do[es] not believe these negotiations will lead to effective progress on global nuclear disarmament.” However, history shows that the prohibition of unacceptable weapons technologies is an essential step towards their elimination. Prohibition precedes elimination, not the other way around. Stigmatisation, which reduces the political and practical support given to inhumane weapons as well as helping to strengthen global norms against proliferation, has been an important outcome of previous treaties that the UK has joined, including treaties to prohibit biological and chemical weapons, anti-personnel landmines and cluster munitions. Like the UK, other states have international obligations as well as a moral duty to pursue measures towards nuclear disarmament. The majority of states consider a prohibition treaty to be the next crucial step towards creating security in a world free of nuclear weapons, a goal strongly supported by the British public and successive governments. A recent poll shows that 75% of UK adults think that the UK should attend the negotiations. The UK’s nuclear arsenal is also deployed entirely from Scotland against the wishes of Scotland’s Parliament and the overwhelming majority of its MPs. The government is clearly putting itself on the wrong side of public opinion as well as on the wrong side of history. Schlosser E (2013), Command and Control. Penguin; Helfand I (2013); ‘Nuclear Famine: Two Billion People at Risk?’ International Physicians for the Prevention of War, http://www.ippnw.org/nuclear-famine.html; Mills MJ, Toon OB, Lee-Taylor J, Robock A (2014). ‘Multidecadal global cooling and unprecedented ozone loss following a regional nuclear conflict.’ Earth’s Future, vol. 2, pp. 161–176. DOI: 10.1002/2013EF000205.